Heading Back to School Has Never Felt So Good! Project Promise 2020 from Kim Hall on Vimeo. Year twenty for me is definitely going to be filled with great challenges and even more satisfaction! This year freshmen students at Morristown Hamblen West and East High Schools are fortunate to be the inaugural class of Project Promise 2020. 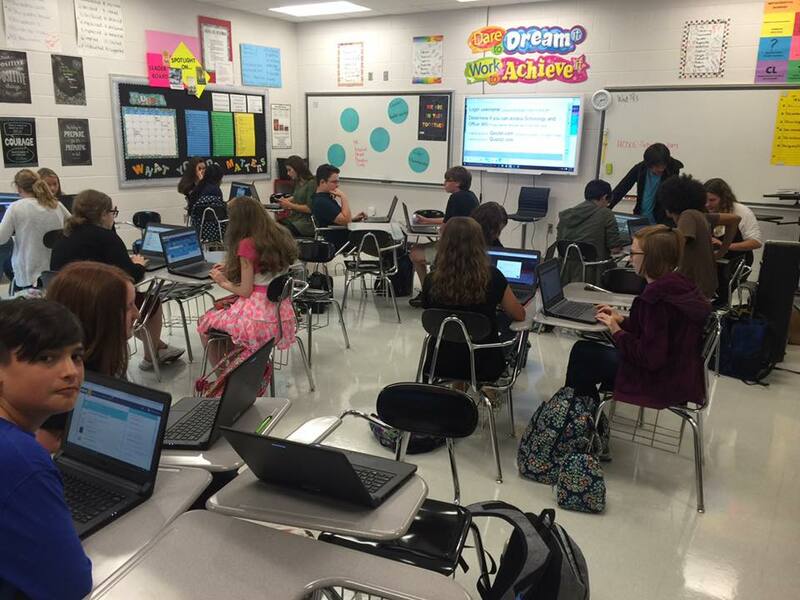 Our school system, which serves Hamblen County, Tennessee population approximately 65,000, has made a commitment to have a laptop in the hands of every high school student by 2020. This is a phenomenal opportunity for our kids that is going to challenge our teachers to really step up our approach to teaching. And I love a challenge! This summer was spent joining in Twitter chats, reading books, reading blogs, as well as contemplating my own blogging, something I had never really attempted and which was incredibly intimidating. This experience has left me feeling much like my students must feel when embarking on a new learning adventure: simultaneously excited and scared. My technology skills are mediocre at best, and unfortunately our training has been a little disappointing. I've felt overwhelmed much of the time because I want to do so much. I want to do everything! I'm learning that I need to take baby steps and master a few basics and build on that foundation. I've been very honest with my kids these early days. We've talked about what I've done to best prepare myself, but I have also discuss my personal fears: how I don't want to let them down, how I worry that my limited technology skills will affect our experience. I've also appealed to them for their help, emphasizing that as digital natives, their knowledge of technology will be a valuable resource for us all. I can't describe how wonderful our conversations have been for the first few days. Honest, genuine interaction that has been incredibly supportive. Everyday my kids and I have grown. And the year is just starting. 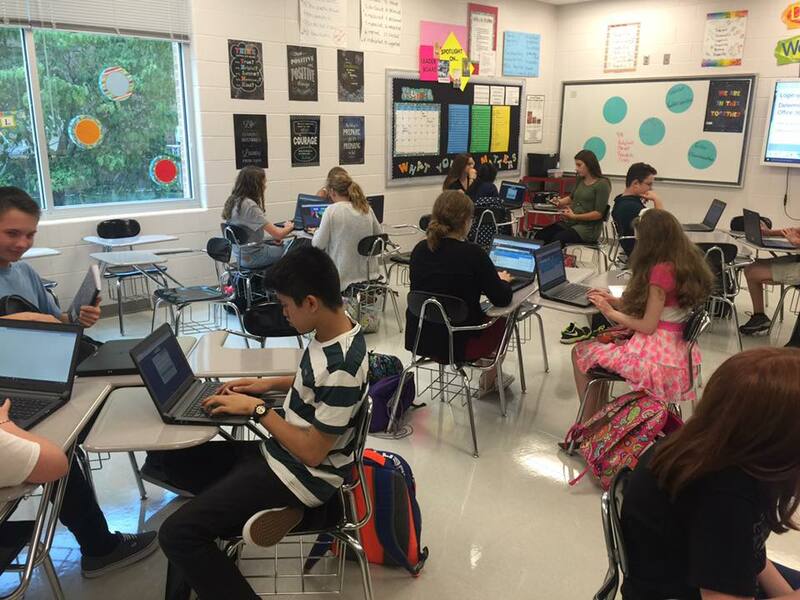 Now that we've successfully established our Schoology and Office 365 accounts, today we began exploring Quizlet and Quizizz. It was such a thrill to see kids helping others in their groups. Those that were more comfortable with the computer were helping those who were more hesitant. I enjoyed observing them, listening to them as they talked each other through the steps. We're just scratching the surface, and I have so much to learn, but I have great anticipation for where we're headed. I know many of the educators I've connected with recently through Twitter are so much more savvy when it comes to the incredible technology resources, and that's okay. I feel incredibly blessed to have such a valuable support group that I can count on to help me as I begin this journey. I'll also enjoy sharing my experiences through my blog. I know my kids will get a kick out of seeing how our journey progresses throughout the year. Nearly nine years ago our school system had teachers from each school attend training in order to establish their own mentoring program that would function autonomously under the umbrella provided by the Central Office program. I, along with four colleagues and an administrator, attended the sessions which spanned a number of days. We recognized that our new teachers were our most valuable resource and that we needed to design and implement a program that would provide them with the support network that would bolster their confidence, enhance their success, and hopefully encourage their dedication. We knew we could not afford to be filling positions again and again, year after year. Our goal then was to establish a mentoring program that would guarantee new teachers would become a long-term investment. Our kids deserved that. Since that time, only one of the original quartet remains with me in this endeavor. She and I have worked diligently to design a plan that provides the assistance our new teachers need while at the same time helping them establish vital relationships with our veteran teachers. "What You Do Matters" is the name we chose for our mentoring program. It seemed to encompass what we believed about our new teachers as well as our experienced teachers. What we do for our students matters. What we do for our new teachers matters. What we do for each other matters. I have uttered these words and phrases probably thousands of times; yet this past year, I realized that I had slowly become fixated on the program at the detriment of our people. This is my My Bad story. This past year, I was so pleased to have a former student join our faculty as a part-time teacher. She was one of six new teachers taking part in our mentoring program. We have at times had as many as fourteen or fifteen new teachers which became a challenge in itself: identifying primary and secondary mentors for each new hire, working to establish a personal rapport with each new teacher, which was a goal I had set for myself at the inception of our plan. This is much easier to accomplish with six compared to fifteen. I was certain this small group would achieve notable success with our guidance. We had a very well organized plan. We knew how to implement this plan without even giving it much thought. We had surveys for self-evaluation, surveys for reflection, surveys to evaluate our mentors. We had countless documents to share: a syllabus with the agenda for the entire year, articles offering advice on any topic a new teacher could possibly imagine, documents that we had created with advice on everything from the first days of school to how to set up your voicemail or secure a substitute. The program was sound. Monthly meetings addressed timely matters so new teachers were prepared in advance. We encouraged new teachers to talk to their primary mentor, secondary mentor regularly, or to come to one of us. But, we cautioned them to seek us out. "It is up to you to seek help or advice if you need it. We all get busy, and I can't anticipate questions you may have or problems you may be dealing with. You've got to let us know what's going on." This is where I put my program before the people I was committed to serving. I learned this the hard way when just days before our semester break in December the young lady I had enjoyed so much in my Honors English I class who was now teaching at her alma mater came to me in tears. "My classes are out of control," she sobbed. "I don't think anyone is learning anything because I can't even keep them in their seats. No matter what I do, they just don't listen." For the next two hours she talked, I listened, and we both cried. I knew the semester was a loss, but in my mind I was desperately trying to figure out how to get her on track for the next semester. Before leaving, we had established a game plan that I hoped she could execute and that I hoped would bring her back to us after the year end. It didn't. She talked with me shortly after school ended and was excited that she had found a dream job in another field, and, as excited as I was for her, I felt as if I had failed her. Yes, I can find much with which to fault her. Because she was part-time and teaching only two morning classes, she often missed our afternoon meetings. She had the agenda. She knew she could come to any of us for help. So I excused her. Yes, she should have said something sooner, but she didn't. I can try to rationalize her unwillingness to do what I'd told her, but that doesn't excuse me. I see now that I need to be the one reaching out, making certain that those who join us those just learning what it means to be a teacher are depending on me. As covered up or overwhelmed as I may feel on a regular basis, she was feeling it every minute she was in our building, and I let her down. I'm ashamed that I didn't realize this sooner. I knew better, but I also put too much faith in my program. I thought that was enough to get us through, but the program was no substitute for the people I'd committed to serving and the relationships we needed to be solidifying. Rest assured we've already created safeguards to prevent this from happening to another new teacher eager to step into his or her classroom and fulfill our program's mission. Like me, these new teachers also believe "What You Do Matters." And in this case, what I didn't do mattered most. EAGER TO GET IN THE GAME! This summer has been one of several firsts: first Twitter chat, first guided reading group for summer reading, first blab video chat, and now first blog. Oh, I've blogged before for students, but that was different. Those posts were nothing more than electronic newsletters. Looking back I see how inadequate that was at the time. Teaching in the 21st century is going to require me to step up my game. Over the past several years, I've slowly been coming to that realization and have hesitantly been exploring just what change was going to be required of me. While my tech skills are pretty limited, I do have one advantage: I love social media! I love the networking opportunities, the branding capabilities, the immediate access to ever-changing information. I know this will be the key to my growth and development, and I know my transformation will mean greater success for my students. I know that to reach my 21st century audience (9th grade English students) I am going to have to become a 21st century learning leader. ​No more sitting on the sidelines for me! I've got some incredible coaches I've discovered while exploring educational leaders on Twitter. I've got an expert team of teachers from around the world who provide not only advice but also support. I must admit I've felt the rookie jitters as I've made my first moves on the court, but with each play I'm feeling more and more confident. I'm looking forward to being a better educator because in the end my students will be the real winners.